1Connect the phone and the computer by using the USB cable. 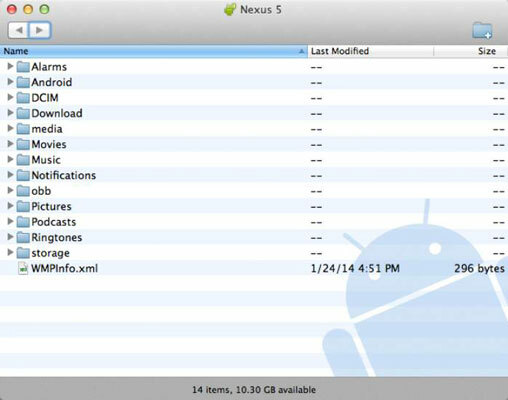 The point of making the USB connection between your Android phone and a computer is to exchange files. 2On a PC, if the AutoPlay dialog box appears, choose the Open Folder/Device to View Files option. When the AutoPlay dialog box doesn’t appear, you can view files manually: Open the Computer window, and then open the phone’s icon found at the bottom of that window. Open the storage icon to view files. The phone’s folder window looks like any other folder in Windows. The difference is that the files and folders in that window are on your cell phone, not on the computer. 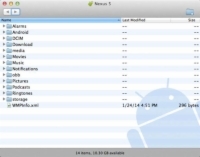 On a Macintosh, the Android File Transfer program should start. 3Open the source and destination folder windows. Open the folder that contains the files you want to copy. The folder can be found on the computer or on the phone. Then open the folder on the computer or phone where you want the file copied. 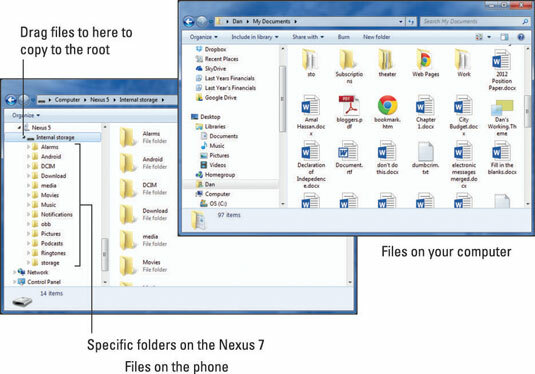 Have both folder windows, computer and phone, visible on the screen, similar to what’s shown. 4Drag the file icon from one folder window to the other. Dragging the file copies it, either from phone to computer or computer to phone. If you want to be specific, drag the file to the phone’s Internal Storage folder or to the root folder. On the PC, drag to the My Documents, My Pictures, or My Videos folder, as appropriate. You can also drag directly to the desktop and decide later where to store the file. The same file-dragging technique can be used for transferring files from a Macintosh. You need to drag the icon(s) to the Android File Transfer window, which works just like any folder window in Finder. 5Close the folder windows and disconnect the USB cable when you’re done. Although this manual technique works, the best way to transfer media to the phone is to use a media program, such as the Windows Media Player. You can also synchronize pictures and videos in the same way by using a media program on the computer.